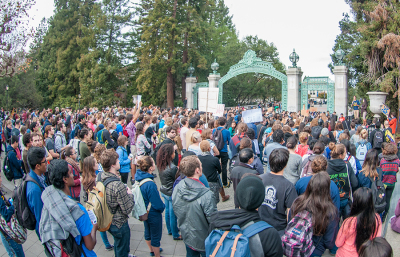 SAN FRANCISCO — A committee of the UC Board of Regents, the university’s governing body, approved a tuition increase plan 7 to 2 despite large on-site student protests, which included at least one arrest, and opposition by Gov. Jerry Brown. The plan will raise tuition by at least 5 percent per year for five years, with a chance for the state to reduce or eliminate the increase through additional funding. The plan will be officially passed during a vote Thursday — which is more of a formality — when the regents as a whole approve all of the committee actions in one vote. This would be the first time in three years tuition would increase. If passed, resident systemwide fees in 2015-16 will increase by $612, from $12,192 to $12,804. The plan would also have the university enroll at least 5,000 more in-state students and 2,000 more nonresident students over the next five years. 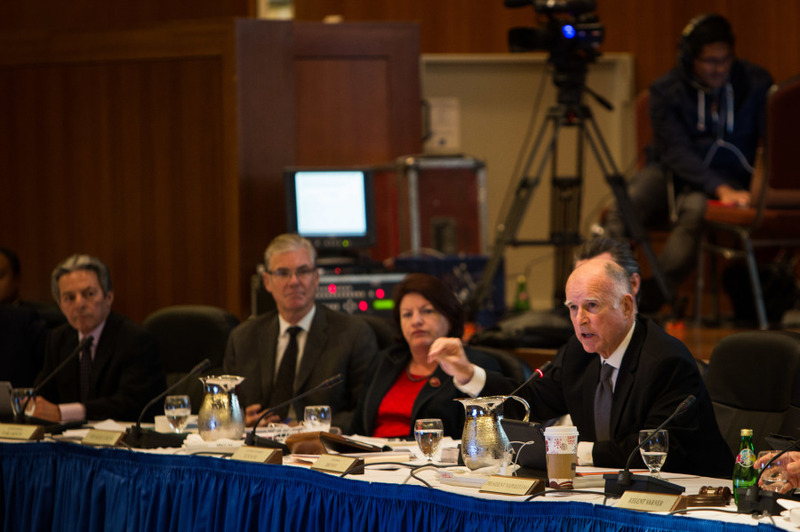 “This is a plan that is integral not only to the stability, but also to the vitality, of the University of California,” said UC President Janet Napolitano at the meeting. 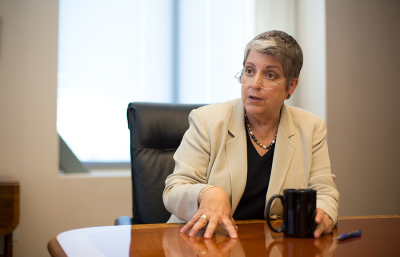 Napolitano proceeded to explain how the university needs to have a long-term financial plan that would provide growth for California student enrollment, maintain robust financial aid coverage and reinvest in academic programs, rather than working on a year-to-year financial plan. This plan is necessary particularly in the context of “massive state disinvestment,” she said. Brown interrupted the debate with a proposal of his own: that the regents shelve the issue until January and at that time begin a joint committee with the state Department of Finance to try to find “better” solutions and curve costs. The committee would be staffed by the “best minds” from both the university and the Department of Finance, Brown said. It would consider a major overhaul of how the university works, including working on pathways for three-year graduations, implementing consistent lower-division major requirements across UC campuses and offering a wide range of online classes that would be enrolled far beyond the limits of a traditional classroom. The committee would also look at expanding the opportunities to get credit through work or military experience and delineating the ways in which different campuses interact to differentiate each campus over time. “Because it’s so hard to create change in complex institutions, sometimes the pressure of not having enough money can force creativity that hasn’t even been considered,” Brown said. Lt. Gov. Gavin Newsom said that under the traditional model of university education, more funds for the university would be necessary. But he said the governor was asking for changes to be made to this traditional model. The regents and Napolitano were receptive to the idea of the joint venture, but Napolitano said the vote was not something that could be put off. UC Student Association President Jefferson Kuoch-Seng criticized the lack of student involvement in the governor’s proposed committee. “What we’re doing cannot be kicking the can down the road,” said Regent Norman Pattiz. The committee passed the proposal, with only Brown and Student Regent Sadia Saifuddin voting no. During the vote, protesters stood up and shouted, trying to drown out the proceedings. Saifuddin did not support either the governor or Napolitano, saying the university should neither compromise its model of being a four-year, classroom-based institution nor compromise affordability for students. Brown not only presented a different vision of what the university could be but also said the university had the funds to sustain itself, pointing to a growth in core funds of about $1.5 billion since 2007-08. 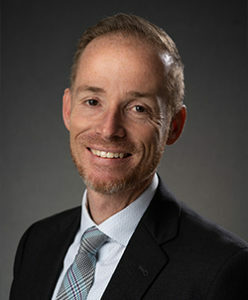 But Nathan Brostrom, the chief financial officer of the university, said that when one subtracts new financial aid costs, the recently renewed contributions to the UC pension system and extra money that returns right back to the state in order to pay off state bonds, university general funds have fallen by about 13 percent per student in real dollars over the same years. The two regents appointed by Brown on Monday did not support the tuition plan but were not on the committee that voted Wednesday. 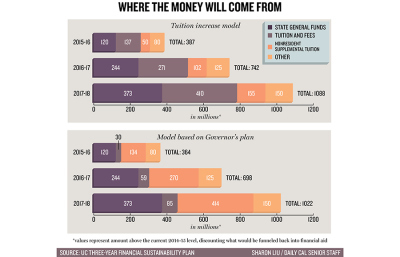 “UC already has a solution if we don’t give them any money — they’re just going to put it on the back of students,” said John Perez, state Assembly speaker emeritus and appointed regent. He is still waiting to be confirmed by the state Senate. The regents also approved a report to the governor, which gave an example of what may have to be cut if the university didn’t have the additional funding from either tuition or the state. To maintain financial aid and investments in academic quality, the plan detailed a reduction in California enrollment by more than 15,000 students, to be replaced by nonresidents. Contact Daniel Tutt and Jean Lee at [email protected].